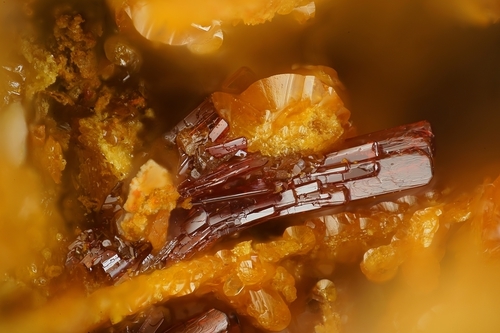 Phoenicochroite: Mineral information, data and localities. From the Greek φοίυικος for "deep red" and χρόα for "colour," in allusion to its colour. This page provides mineralogical data about Phoenicochroite. Perfect in one unspecified direction. Crystals tabular and imperfect, often reticularly intergrown. Massive; thin coatings. 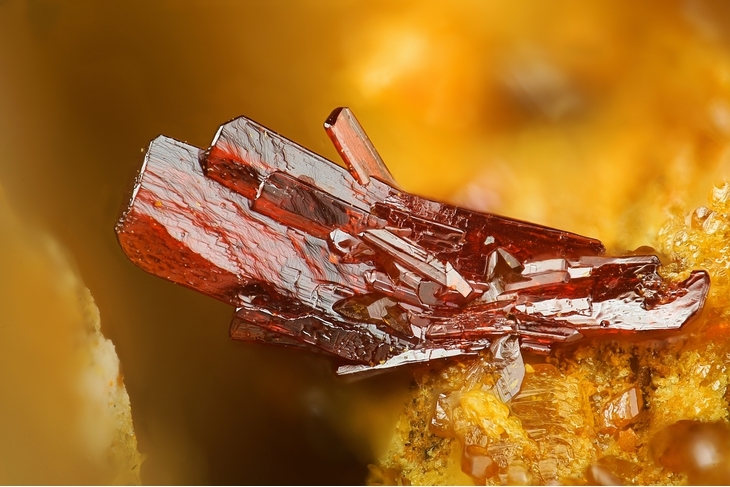 Berezovite Discredited - shown to be altered phoenicochroite by S.A. Williams (1974). Hemihedrite 22 photos of Phoenicochroite associated with Hemihedrite on mindat.org. Vauquelinite 7 photos of Phoenicochroite associated with Vauquelinite on mindat.org. Schwartzembergite 7 photos of Phoenicochroite associated with Schwartzembergite on mindat.org. Crocoite 6 photos of Phoenicochroite associated with Crocoite on mindat.org. Iranite 6 photos of Phoenicochroite associated with Iranite on mindat.org. Mimetite 4 photos of Phoenicochroite associated with Mimetite on mindat.org. Galena 4 photos of Phoenicochroite associated with Galena on mindat.org. Seeligerite 2 photos of Phoenicochroite associated with Seeligerite on mindat.org. Wulfenite 2 photos of Phoenicochroite associated with Wulfenite on mindat.org. Wickenburgite 2 photos of Phoenicochroite associated with Wickenburgite on mindat.org. Soluble in HCl with separation of lead chloride. Chromate minerals contain the carcinogenic and mutagenic chromate ion. Always wash hands after handling. Avoid inhaling dust when handling or breaking. Never lick or ingest. Do not pour chromate-containing solutions down the drain. Hermann (1833) Annalen der Physik, Halle, Leipzig: 28: 162 (as Melanochroit). Thomson, T. (1836) Outlines of Mineralogy, Geology, and Mineral Analysis. 2 volumes, London (as Subsesquichromate of Lead). Glocker, E.F. (1839) Handbuch der Mineralogie, 2nd. edition, Nürnberg: 612 (as Phœnikochroit). Haidinger, Wm. (1845): 504 (as Phönicit). Petterd, W.F. (1910) Catalogue of the Minerals of Tasmania. 221pp., Hobart: 114. Larsen, E.S. (1921) The Microscopic Determination of the Nonopaque Minerals, First edition, USGS Bulletin 679: 119. Palache, C., Berman, H., & Frondel, C. (1951), The System of Mineralogy of James Dwight Dana and Edward Salisbury Dana, Yale University 1837-1892, Volume II. John Wiley and Sons, Inc., New York, 7th edition, revised and enlarged, 1124 pp. : 649-650. Williams, S.A., McLean, W.J., Anthony, J.W. (1970): A study of phoenichchroite - its structure and properties. American Mineralogist 55, 784-792. 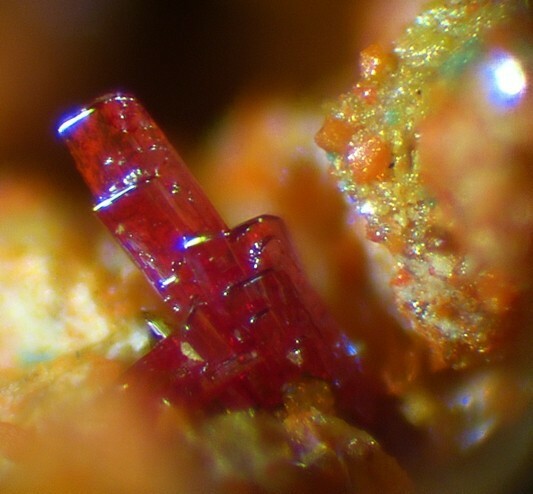 Cesbron, F., Williams, S.A. (1980): Iranite-hémihédrite, bellite, phoenicochroite, vauquelinite et fornacite: synthèse et nouvelles données. Bulletin de la Société française de Minéralogie et de Cristallographie 103, 469-477. In the collections of Brent Thorne, Christian Rewitzer, and Sandro Maggio. Russo M., Campostrini I., Demartin F. (2014): Fumarolic minerals after the 1944 Vesuvius eruption. Plinius, 40, 306. Temple, A.K. (1955) Trans. R. Soc. Edinb. 63, 104.; Livingstone, A. and Macpherson, H.G. (1983) Fifth supplementary list of British minerals (Scottish). Mineralogical Magazine, vol. 47, n° 342, p. 99-105. Anthony, J.W., et al (1995), Mineralogy of Arizona, 3rd.ed. : 103, 420; Williams, S.A. (1968), Wickenburgite, a new mineral from Arizona, Am.Min. : 53: 1433-1438; Williams, S.A. & J.W. Anthony (1970), Hemihedrite, a new mineral from Arizona, Am.Min. : 55: 1088-1102; Williams, S.A., et al (1970), A study of Phoenichchroite-Its structure and properties, Am.Min. : 55: 784-792. Collected in the presence of & verified by C. Lemanski, Jr.
Galbraith, F.W. & D.J. Brennan (1959), Minerals of AZ: 67. Anthony, J.W., et al (1995), Mineralogy of Arizona, 3rd.ed. : 327. Anthony, J.W., et al (1995), Mineralogy of Arizona, 3rd.ed. : 327; Silliman, B. (1881), Mineralogical notes, Amer.Jour.Sci. : 22: 198-205; Galbraith, F.W. & D.J. Brennan (1959), Minerals of AZ: 67. Anthony, J.W., et al (1995), Mineralogy of Arizona, 3rd.ed. : 247, 327; Williams, S.A. (1968), Wickenburgite, a new mineral from AZ, Am.Min. : 53: 1433-1438; Williams, S.A. & J.W. Anthony (1970), Hemihedrite, a new mineral from AZ, Am.Min. : 55: 1088-1102; Williams, S.A., et al (1970), A study of phoenicochroite-Its structure and properties, Am.Min. :: 55: 784-792. Anthony, J.W., et al (1995), Mineralogy of Arizona, 3rd.ed. : 327; Galbraith, F.W. & D.J. Brennan (1959), Minerals of AZ: 67. Analyzed at the University of Western Sydney, Austalia. Anthony, J.W., et al (1995), Mineralogy of Arizona (1995), 3rd.ed. : 247; Williams, S.A. & J.W. Anthony (1970), Hemihedrite, a new mineral from AZ, Am.Min. : 55: 1088-1102.